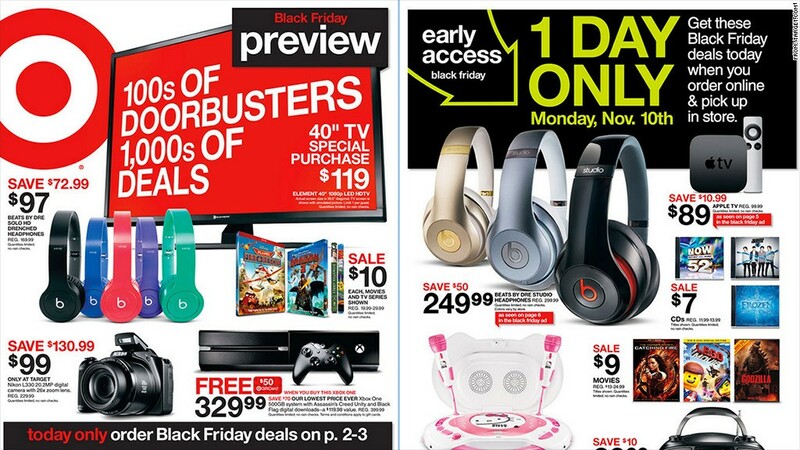 Target sent out a digital version of its print circular to tout its holiday deals on Monday. Target really wants your business this holiday season. So much so that it's offering free money -- in the form of discounted gift cards. Target (TGT) also unveiled a host of holiday season deals geared to get people into its physical stores. Some discounts, including $50 off of Beats headphones and $10 off an Apple TV, only apply if customers order online and pick up their items at a store. And the store's mobile app will offer 50% off a different toy each day throughout the holiday season. Target stores will open at 6 p.m. on Thanksgiving Day, but for shoppers who just can't wait, there will be online-only deals all day. It will offer freebies like gift cards and video games with the purchase of hot products like the iPad Air 2, Xbox One and Sony PlayStation 4.